HICKORY, N.C. – This is a beautiful place to be laid to rest. A little cemetery by a little church by a little winding road. The headstones all look pristine, facing the white spire of the church like worshipers in pews. On a nice day, they gleam. But there's something else here – something unique: the names on the graves. 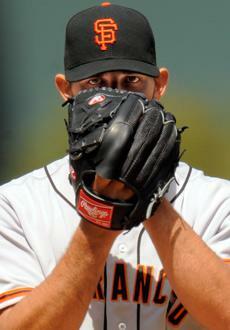 Bumgarner. That name is on one tombstone after the other after the other. So many Bumgarners have lived here over the past century that the locals refer to this tiny area of rural North Carolina as "Bumtown." About 100 Bumgarners still live here today. Just down that hill is a 76-year-old lady named Mary, living alone and going strong. And across the street from the Bumtown graveyard is her son, a tall, bald man with a vaguely familiar, lopsided smile. "Welcome to nowhere," says Kevin Bumgarner, 51, standing in his garage. "Bumtown" so named almost a century ago for all the Bumgarners living on both sides of Deal Mill Road – is actually a mile northeast of Sawmills, four miles southeast of Hudson, three miles northeast of Granite Falls, three miles west of Oak Hill, nine miles south of Lenoir, four miles northwest of Dudley Shoals and 10 miles northwest of Hickory. Bumtown is a town that isn't a town. But this isn't nowhere – not anymore. 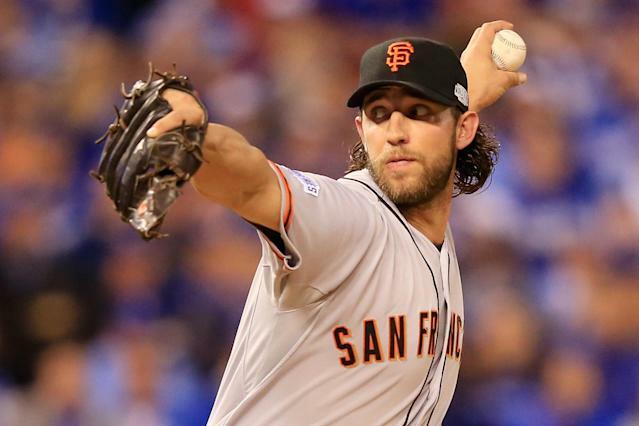 This is the hometown of the most famous Bumgarner: Madison, the 22-year-old San Francisco Giants pitcher with a World Series ring and a $35 million, six-year contract extension as of Monday. Madison's great-grandfather once owned the plot of land where he's now buried. His grandfather is buried there, too. But it's Madison who finally made a name for this area, and he did it by leaving. "There's just a lot of Bumgarners there, for whatever reason," Madison told Yahoo! Sports during spring training. "I don't ever think I thought anything about it." But maybe we should think about it, just for a little while. Because Madison Bumgarner's ascent makes Bumtown even more remarkable. Plenty of baseball players come from "nowhere," but not many come from a place quite like this. Madison's dad, Kevin, will be our guide. He jumps into his truck and pulls out of his driveway. 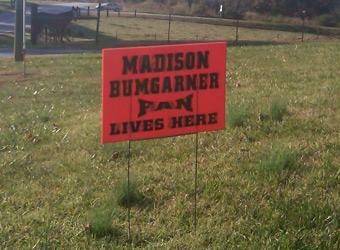 He drives past some horses and a sign in Giants orange that reads "A Madison Bumgarner fan lives here." (The signs were Madison's grandmother's idea.) Kevin says there used to be a Bumtown school – which he attended – and a Bumtown grocery, which now has another name. He points it out with a grin. Then he turns a corner, clears his throat, and mutters: "Looks like an H-bomb went off." For many years, this part of the Blue Ridge foothills was covered in furniture stores. "Furniture capital of the world," Kevin says. "Twenty-eight miles of furniture." But now it's just 28 miles. Broyhill Furniture used to be headquartered a bit north of here, in Lenoir. Madison's mom worked there for most of her life. Pretty much everyone did. "If you worked at Broyhill," Kevin says, "you have a job 'til you died. Broyhill and other companies started outsourcing to other countries in the '90s. The local labor force couldn't really cope. "Everybody would graduate, go to a plant, and think they'd be somebody," Bumgarner says. "Instead they turned into dustheads." Bumgarner says that's a term for guys who fix up furniture in their backyard. It's like a rural version of the urban car mechanic with the blocks set up in the driveway. Seems like every other building is shuttered. There are plenty of signs – funny signs, like a mulch company imploring drivers to "Get Loaded," and one for a place called "Hissy Fitz" – but not much traffic. "Caldwell Freight Lines just closed," Kevin says. He says there's a new Google server farm nearby, but nobody knows anyone who's gotten a job there. "No dustheads get jobs," he says. "It's just a dryin' up town." Against this backdrop of decay, a baseball prodigy was raised. His first word was "ball." But Madison Bumgarner was more likely to be a dusthead, at least if you ask his father. Kevin Bumgarner has more to show for his woodworking skill than his baseball prowess. He built the log house where Madison grew up. But baseball? "I didn't play high school baseball," he says. "Couldn't hit a curve. I was 72 pounds in the first grade." Needless to say, Madison's dad was nervous that his only son would never make it out of town. After all, how many of his family members had? He turns a couple of corners and points to the boyhood home of the kid they called "Maddy." It's hidden behind a thicket of trees. Kevin doesn't want to trespass. But then a car drives up behind him and things get awkward. Fortunately, the lady is sweet; she takes care of the elderly for a living. She invites him in. He hasn't been in the house in years. There are stairs up to the loft where Madison slept. There are stairs down to a small storage space where "Dad" is scrawled into a shelf. But there's nothing else. There are no dented doors or bruised walls from a boy's heaters. The new owner had no idea Madison even lived there. Kevin doesn't really talk about it. He even disputes that "Dad" is a tribute from Madison. Instead, he points to the high ceilings and suggests a way for the new owner to clean them without much trouble. Then he smiles, nods and leaves. So we've seen the place where greatness started, and it sure didn't look like the beginning of greatness. Neither does the place where Madison played his first baseball game. It's a dirt field surrounded by a chain link fence and two tiny wooden dugouts that look more like huts. It looks like it hasn't been used in decades. There's a huge brick lying only a few feet behind home plate. Madison didn't even pitch back then. He played center field. Kevin had to sign a waiver because it was a league for 5-to-8 year-olds and Madison was 4. Only a short drive away is the next diamond where Madison played – from ages 6 to 9. It's called the Granite Falls recreation center. After age 9, Madison was "banned" from playing here, according to his dad, because he had joined an AAU team. The rec center didn't want the boy playing on both teams. So much for home cooking. No big deal. Kevin waved it off and kept taking Madison here to practice. One day a former minor-league ballplayer named Joe Sutton showed up and Bumgarner asked him what he thought of his son. Sutton said, "If he's drafted in the third round or higher, go straight to the pros." The Bumgarners weren't sure Sutton was serious. Kevin wasn't even asking about the boy's big-league prospects. Madison was only 11. But as it turned out, Madison would play on one of the best AAU teams in the state, win a high school state title, and then turn down a scholarship offer from North Carolina to enter the draft in 2007, straight out of high school. How did this happen? And how did it happen in Bumtown? "It's really not a big deal to me," he says of his roots. "I don't think it's a big deal to anybody. It just happens to be that way." Madison's a left-handed World Series winner and neither parent is a left-hander. In fact, Kevin says, "Throwing a ball is the only thing he does left-handed. He bats right-handed, plays golf right-handed, shoots a bow-and-arrow right-handed. His brothers (from his mom's prior marriage) are right-handed." Madison seems unflappable – especially for a 22-year-old. Kevin? Not so much. The day before Madison took the ball in the World Series two seasons ago, "I was trembling," he says. "Madison was fast asleep." And did we mention Madison's delivery? Three-quarters and unorthodox to say the least. "I'd love to take credit for it," Kevin says, "but I don't know. I just got lucky." There's more: Not only did Madison marry his high school sweetheart, Ali – who's also from here – but he married her in a private ceremony while wearing jeans and a pocket knife. Not exactly high-maintenance. "Madison's a great guy," his dad says. "He's probably a better person than I am." The only thing the elder Bumgarner will say he did right was try to guide his only son away from trouble. "There are people in life who will do everything they can to help you succeed," he told Madison. "And there are people in life who will do everything they can to make sure you fail. Those people look exactly the same." That's part of why Kevin built a literal wall around his son's high school bullpen – to keep scouts and agents out. But Madison got lots of help in that area from his mom, Debbie, who is quite religious and made sure her son was rooted in the same faith. She kept him humble and kept him honest. So basically Debbie guided Madison along the right path, and Kevin guided him along the base path. It was that simple. Madison and his dad were on the baseball field two hours a day throughout his childhood. When Kevin and Debbie divorced, they worked out custody so that Madison could stay at the best high school and continue on his team. Divorce lingers in the heart of a son for years after the fact, and there was the added pain of losing a sister to cancer during his first major-league season. But nothing seemed to rattle Madison for long. If nothing was treated as a big deal, then nothing became a big deal. And Madison never acted like he was a big deal – even on the day he got the call to come to San Francisco, and he took only his glove and his cleats to the airport. Even on the day he pitched eight scoreless innings against the Rangers to win a World Series game at age 21, Tom Boswell of the Washington Post wrote Bumgarner had "no apparent pulse." Throughout his Bumtown life, Madison rarely got overanxious and his dad never got tired. They just played, every day, father and son. And in 2008, when Madison came home to pitch against the Hickory Crawdads as a member of the Single-A Augusta Greenjackets, the entire community of "Greater Bumtown" showed up. It was the largest crowd ever for a baseball game there, and they left the lights on afterward so Madison could sign every autograph. Finally, at the end of the long line, there was a local kid without a pen or a piece of paper. Madison looked at him and scrambled to find something to write on. "No, no," the kid said. "I just wanted to say 'Good job.' "
It's getting dark now and Kevin Bumgarner winds his way home. He still lives in the house he grew up in nearly 50 years ago. He has no plans to move. His son is now a multi-millionaire. He's set for life. Maybe Dad wants a new place? "Lord no," he says. "If I won the lottery tomorrow, the only thing I'd do is put a pool in my house. I don't need anything. People always say to me, 'Man I can't believe you're working.' Well, the Giants haven't written me a check. That's his money." Kevin Bumgarner works the night shift at a food distribution company. He makes about $18 an hour. He used to make $40,000 at another job, but he says likes this new gig because it allows him to umpire on the side. More than the money or the house or the amenities, he just wants to be near the game the way he was when his boy was around. Looking out the car window now, Kevin says, "Those were the best days of my life." At this he starts to well up. But he waves away any pity. Madison owns a house about 30 minutes from Bumtown and he visits in the offseason. "He has to grow his own wings," Kevin says. "He'll be back." Madison himself, when asked about his hometown during spring training in Arizona, sounded like his dad: "It's just home. It's where I grew up. I always look forward to going back there. There's no place like home for anybody. That's pretty much it, I guess. There are definitely a lot of Bumgarners there. But it's just home." The story of Madison Bumgarner is a faint echo of the "Giving Tree," the famous Shel Silverstein book in which a tree gives a little boy its leaves, its branches, its trunk – all so the boy would be happy. Eventually there's nothing left but a stump. Yet the boy comes back in old age to rest, and the stump can provide. And the tree is happy. Such is the story of Bumtown and its prodigal little boy. There isn't much left here – no more thriving industry, no fancy stores or four-star restaurants. But there is a family. There is a resilient community. There is a church. There is some pretty land on some rolling hills. There are a few diamonds on which to play. That may seem like nothing much. But it was plenty for Madison Bumgarner. And it's plenty still.